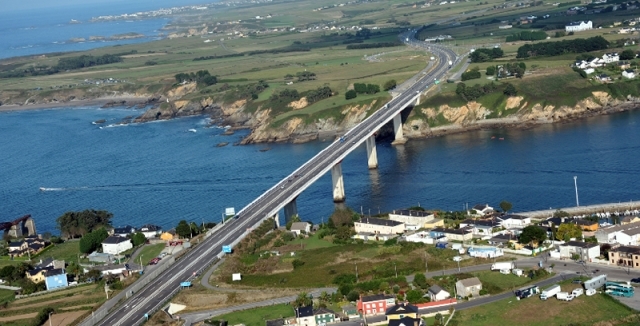 The northern Way or, the Camino of the Coast, takes place on Galician soil once the bridge of Ponte dos Santos, in Ribadeo, has been crossed. The signposts are somewhat confusing at first however, things become clearer upon crossing the urban centre. Normally on the first stage in Galicia, in the province of Lugo, pilgrims opt to extend the itinerary to Lourenzá, a location of medieval origin and of important historical heritage. This option involves a stretch of 29 kilometres, with four albergues on route, however throughout 16 km there are no services at all, not even a bar. In terms of difficulty it is achievable although, walkers should take extra care on the on the two tough climbs involved: one in A Ponte-Arante and the other, at the end of the stage, on the border between Barreiros and Lourenzá. CAUTION PILGRIMS: Upon entering Galicia the most open part of the shell sign signals the route to be taken. The historic town of Ribadeo is the gateway to the Northern Way in Galicia. The majority of pilgrims choose to cross the bridge of Dos Santos, after which a change in the official signs for the Jacobean route may lead to confusion, given that in Asturias the closed part of the shell-considered to take the form of a star- signals the Camino to be taken, while the other routes are more commonly signalled by the open part of a scallop shell. The directions are precarious. In the event of difficulties recommendations are to visit the tourist office and acquire a street map and, more precise information about the route. After saying goodbye to the sea, walkers face the first climb of the route towards Ove. After passing the viewing point of Santa Cruz walkers reach Fonte do Valín, a water spring that attracts a number of people, for its high quality and for being a refreshing pilgrim stop. Hikers pass through Cabelas and Vilela, where they will find Casa Doñado and Pena Vilela, a hotel and a rural house, both under the same ownership as the municipal albergue, next to the Meson and ancient school of Vilela. This is the last possible place where walkers can purchase supplies, at least until reaching Lourenzá, 16 kilometres away. From here the route continues uphill passing Celeiros, Vilar, (this area can become muddy after rain), the parish church of San Vincente de Cubelas and, the sanctuary of Our Lady of Virtues. The forest track moves downhill until reaching A Ponte-Arante (17 kilometres to Lourená). From A Ponte the first difficult climb of the day begins. After which the council of Barreiros is reached, Vilamartín Pequeno, Vilamartín Grande and, the road of Barreiros-Trabada (LU-P-6103) on which hikers descend towards Gondán and its municipal pilgrim albergue. This establishment has a drinks vending machine, an outdoor washing area and an outdoor seating area. From here the route continues in descent to the parish of San Xusto de Cabarcos, at the other side of the river Puxigo. This is good place to recuperate strength and here walkers will find the bar A Curva, and its restaurant. The owners also manage the albergue of San Xusto, next to the bar and also the establishment in Gondán. After another smooth stretch, there is a rather difficult climb on a gravel path, its summit surrounded by forest tracks, leads to the council of Vilanova de Lourenzá. The albergue is situated in the centre and this location boasts all kinds of services. By bike A bearable stage for cyclists, the only difficulty involved is the climb from A Ponte-Arante, on cobbled stones and, the final summit from San Xusto (Barreiros) until entering Lourenzá. There is also the possibility that walkers will encounter very muddy areas, especially after rain, between Vilela and A Ponte. The alternative route is on the LU-133 road, until reaching the shrine of Our Lady of Virtues (Nuestra Señora de las Virtudes). 1 reviews Distance to Santiago: 195 km. 1 reviews Distance to Santiago: 175 km.